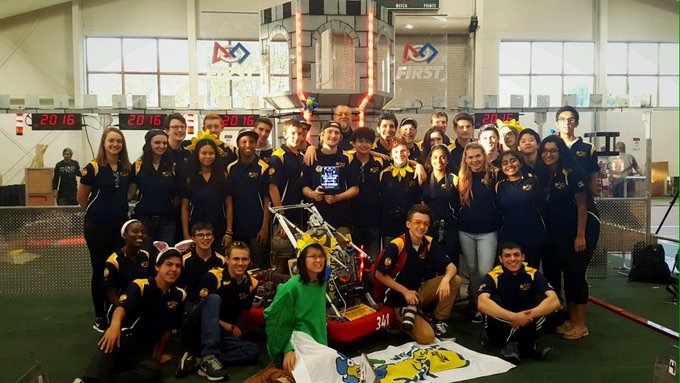 Three high school teams formed the winning alliance at Saturday’s 2016 Duel on the Delaware–from Philadelphia, FRC 341 MissDaisy, from Downingtown FRC 1640 Sa-BOT-age, and from South Jersey, FRC 5420 Velocity. The annual “off season” event, held at Salem Community College in Carneys Point, NJ, is cosponsored by southern NJ team 316, the Lu-na-tecs, and FSR team, MOE365, the Miracle Workerz. In addition, teams collect and donate books for Success Won’t Wait– a Wilmington-based charity that distributes books to children’s charities, hospitals, and other organizations serving people in the tri-state area. Top winners receive a trophy for the most books (by weight). The event total this year was over 11,500 pounds of books and the 2016 book drive winner was Team 271, the Mechanical Marauders from Bay Shore, NY. A big thanks to all our event volunteers and sponsors! Last October 17, the Duel on the Delaware (near the Delaware River in NJ) was a great chance for our team to share ideas with a variety of other teams and to get some practice on the field with other robots. 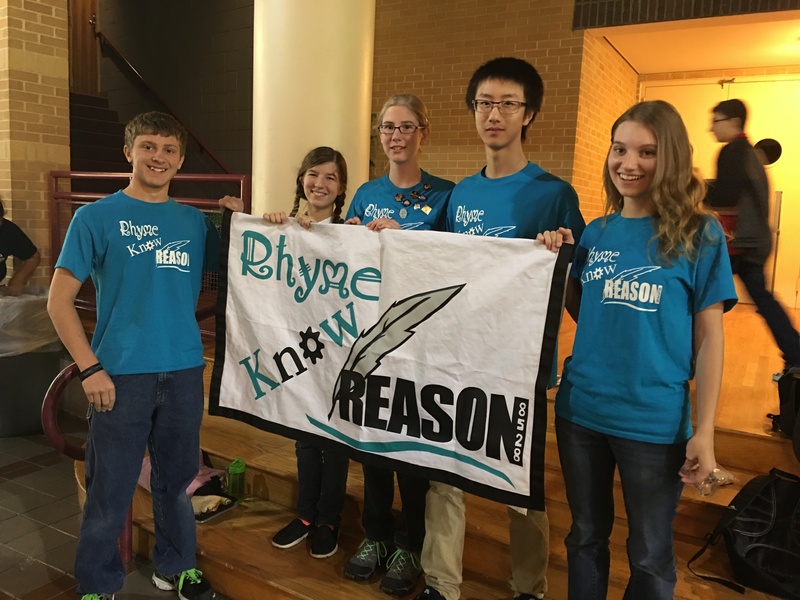 Our sister team, MOE FTC 365, also attended the event. In the morning two student members of our team taught an Engineering Notebook workshop to a full classroom of students from roughly ten different teams. We described what an engineering notebook was, why it was important, challenges and how to overcome them and more. After the presentation we shared our old notebook with everyone and shared ideas and advice with them one on one. Thankfully, everyone took a lot of notes and seemed to get a lot out of the workshop. We may even be asked to teach this workshop a third time at another scrimmage. Meanwhile, our teammates were learning programming at other workshops. The night before the Duel, we worked really hard to make a solid chassis to use in the scrimmages but we didn’t have a second set of technology to install on it. Our Pennsylvania friends, the Flaming Phoenixes, had the tech but not a new chassis; but working together, we had a completely functioning “Flaming Rhymes” robot. At the Duel, we spent the afternoon working on it and competing together while sharing ideas, tools, and drive teams. As the photo shows, we were proud to display our fantastic new team banner. Overall the day was a fun start to the (almost) competition season! Highlights from this year’s Duel on the Delaware October 17, 2015 at Salem Community College, Carney’s Point, NJ. 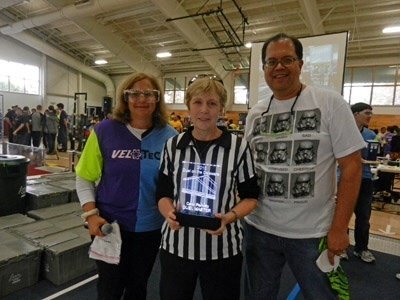 The Mike Wade Duel Master Volunteer Award was presented to Carol Perrotto, a founding member of MOE Booster organization, a Mid Atlantic Robotics and First State Robotics board member, and an FRC head referee at both regional and international levels.